Well, if I can’t have the real thing, I’ll just pretend (aka be in denial.) And this cake is helping with that effort tremendously. 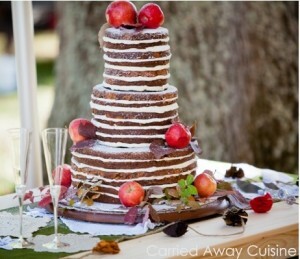 I’m a big fan of the naked wedding cake, and one topped with apples? Even better. And this cake is just-so perfect. The layers, sandwiched together with thick frosting (I hope it’s cream cheese. Because it totally is in my cake fantasy), dusted ever so lightly with powdered sugar, and garnished with leaves and apples. The cake pedestal is beautiful, too; I really dig the finished warmth of the wood. Time to weigh in again: do you love or hate the naked wedding cake? Let me know below!